The Bell01621 843208work Bed & BreakfastThe Bell is in the centre of the historic town of Maldon, dating from the 15th Century, it has many interesting features. This delightful home is opening as a family run guest house. Breakfast includes local and home made products. It offers a peaceful haven in the small town with a delightful walled garden and a comfortable sitting room for guests to relax. Our master bedroom with its large bathroom and dressing room would serve as a delightful Bridal Suite for weddings at the adjacent All Saints Church and the Blue Boar Hotel. The Bell is in the centre of the historic town of Maldon, dating from the 15th Century, it has many interesting features. This delightful home is opening as a family run guest house. Breakfast includes local and home made products. It offers a peaceful haven in the small town with a delightful walled garden and a comfortable sitting room for guests to relax. Please visit our Web site at www.thebellmaldon.co.uk. 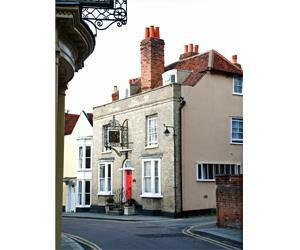 The Bell Guesthouse is Located in the Essex Town of Maldon, on the Blackwater Estuary. Braintree and Witham and the port of Harwich is 60 minutes away via the A12 north.